Continental Mills is recalling the blueberry pancake mix because it contains blueberry nuggets made from a small percentage of General Mills flour that was recalled for E. Coli. 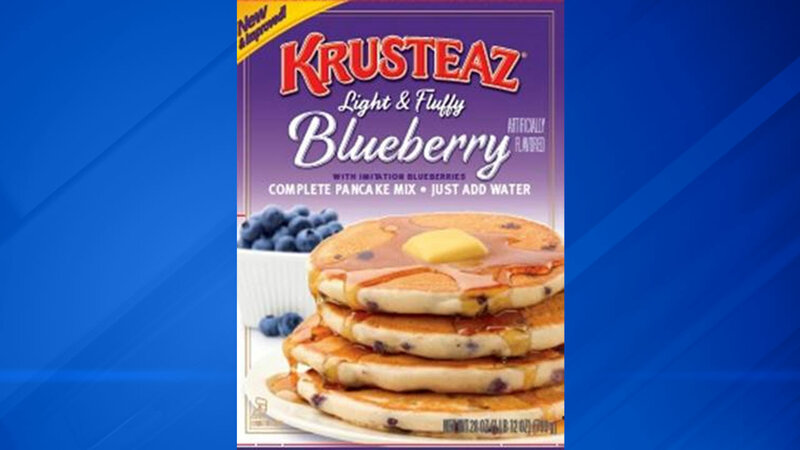 Continental Mills announced a recall of some of its Krusteaz Blueberry Pancake Mix that was made with flour recalled for being linked with E. coli. The company said its supplier said blueberry nuggets contained in the mix were made with a small percentage of flour that was recalled by General Mills for E. coli contamination. The recall affects 28 oz. cartons of Krusteaz Blueberry Pancake Mix with a best by date code between 3/30/2018 and 6/16/2018 and UPC code 041449001289. The recall also affects 3.5 lb. bags of Krusteaz Blueberry Pancake with a best by date code between 4/27/2018 and 4/28/2018 and UPC code 04144900148. Continental Mills is offering refunds to customers who bought recalled mix. No illnesses have been reported in connection with the pancake mix. For more information, call the company's recall hotline at 1-800-457-7744 Monday through Friday from 9 a.m. to 6 p.m. or click here.